Set ini terdiri daripada Permainan Pasir 2kg, 36 Aksesori pelbagai bentuk (dipilih secara random) dan Tray permainan..
Ianya sesuai untuk anak anak berusia 4-12 tahun bermain sama ada dirumah atau diluar rumah. 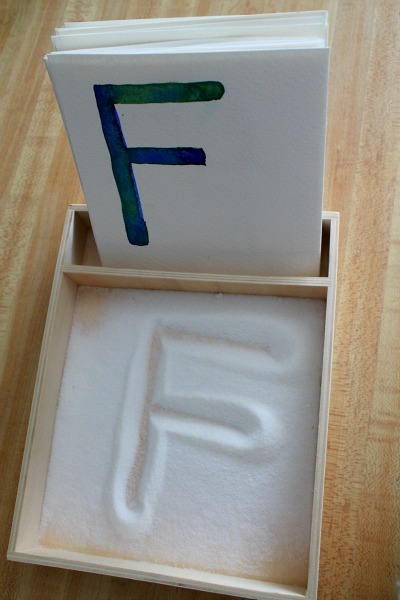 The other night I put together this salt tray and set of alphabet cards set for Simon. He has been into learning about letters lately, and loves to trace things. Also, anytime he gets to do sensory play is exciting for him. 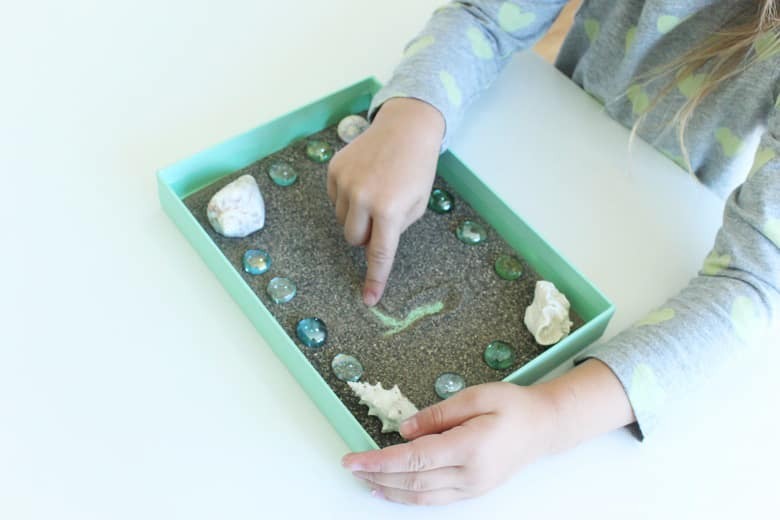 There are so many different, awesome ways to make salt trays and to play with them, but the one that inspired me was from this great Montessori site. I re-purposed a wooden tray that came from a Melissa and Doug lacing card toy that Simon got for Christmas. The cards, I made by cutting up pieces of various thick watercolor paper that I had on hand. I made all the cards the same size, just right for inserting into the small compartment on the wooden tray. I painted all of the letters of the alphabet in capital on one side, and lower case on the back. In addition to working on making letters, Simon also likes to use the tray to draw pictures. Sometimes he asks for a q-tip to do this. He really likes running his hands through the roughly textured salt, and making little piles in the tray too. As for the alphabet cards, we have spread those out in a line on the floor, and sung our ABC’s as we walked along, stepping and jumping in front of each letter. We’re happy to have Christie from MamaOT.com join us today as she gives us peek into some of the therapeutic benefits of Kinetic Sand. Have you ever heard of Kinetic Sand? It’s super cool but extremely difficult to describe. Kinetic Sand is a sand-like substance that is easily moldable, yet also free flowing. It hardens when squeezed, yet “melts” when released. It has the properties of wet sand, yet is not wet. It sticks to itself, yet is not sticky. It is soft, yet not fluffy. Like I said, difficult to describe! As a pediatric occupational therapist, I am always looking for materials that can be used in therapy to help children further their developmental skills. Kinetic Sand is an ideal therapeutic material due to its versatility and its ability to offer a wide variety of benefits to the kids (and adults) who engage with it! Kinetic Sand is a hands-on material so, yeah, it can help develop fine motor skills! Squeeze it, squish it, or smash it with a potato smasher to strengthen hands. Poke it or pinch it to further develop those index finger skills. Roll it into balls or flatten it with a rolling pin to developbilateral skills. Scoop it or cut it to practice grasping and using tools such as spoons, ice cream scoopers, and knives. Press cookie cutters down into flattened sand or pack it into little cups and flip them over to build sand castles and further develop those small muscles in the fingers and hands. The fine motor benefits are seemingly endless! Kinetic Sand is the perfect sensory material for kids who either crave or are sensitive to tactile input. Kids who want to touch everything and are constantly seeking tactile input will gladly touch, squeeze, and play with Kinetic Sand … it might seem like they won’t be able to get enough of it! Because Kinetic Sand can be squeezed it provides deep pressure, which is a form of tactile input that is calming and organizing to the body. This is especially helpful for those who are sensory seekers! 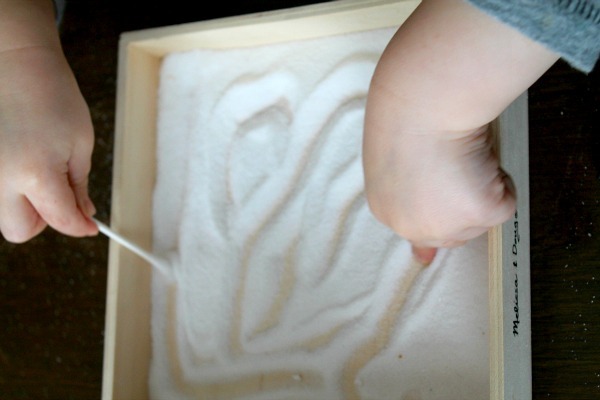 On the other hand, kids who are sensitive to or avoidant of “messy play” experiences (or who are hesitant to try out new things in general) will likely be open to engaging with Kinetic Sand due to its soft, non-sticky texture. I have seen this first-hand with my tactile defensive OT kiddos. You really have to feel Kinetic Sand to know what I mean. Even though it looks and acts like wet sand, it is soft, dry, and cool to the touch. It doesn’t get stuck in your fingernails and doesn’t feel sticky or scratchy. Perfect for kids with tactile defensiveness. 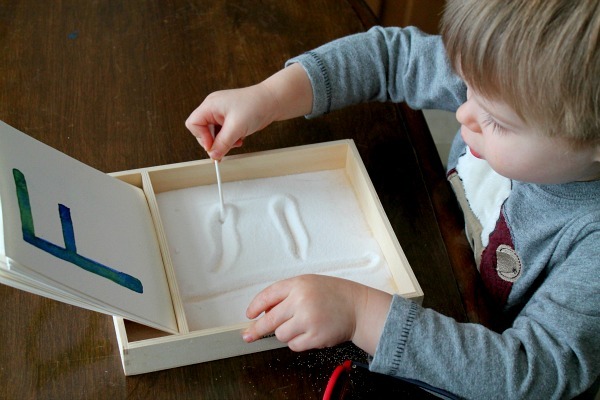 Even if the child is not open to touching the Kinetic Sand right away, they can easily engage with it by using a tool such as a spoon in order to avoid touching it but still get used to engaging with it. Before kids are old enough to use a pencil to learn to write (which really should not take place until Kindergarten), they should be given opportunities to practice their drawing and pre-writing skills in multi-sensory materials. Kinetic Sand is perfect for this! Kids can use their fingers or tiny tools (such as toothpicks, Q-tips, or the non-brush end of a paintbrush) to scribble, doodle, or draw shapes or pre-writing strokes. This can give them some additional sensory input and help them practice their pencil grasp without even using a pencil! Find more fun multi-sensory activities for drawing and pre-writing on my blog by clicking HERE. Because Kinetic Sand is an open-ended material (i.e., there is no one right way to play with it), it can be great for challenging kids to use their creative thinking skills. This is part of something that we in the OT world like to call “praxis”. Praxis consists of three steps — ideation, motor planning, and execution. When engaging with an open-ended material, a child first must engage in ideation — being able to come up with an idea for how to engage in a novel motor task. Once ideation is achieved, the child must then be able to come up with a cognitive “motor plan” for how to go about that novel motor task. Once the motor plan is established, then they can follow through with it, thus demonstrating “execution”. Kinetic Sand is especially useful for addressing ideation, which can be particularly challenging for children with autism. 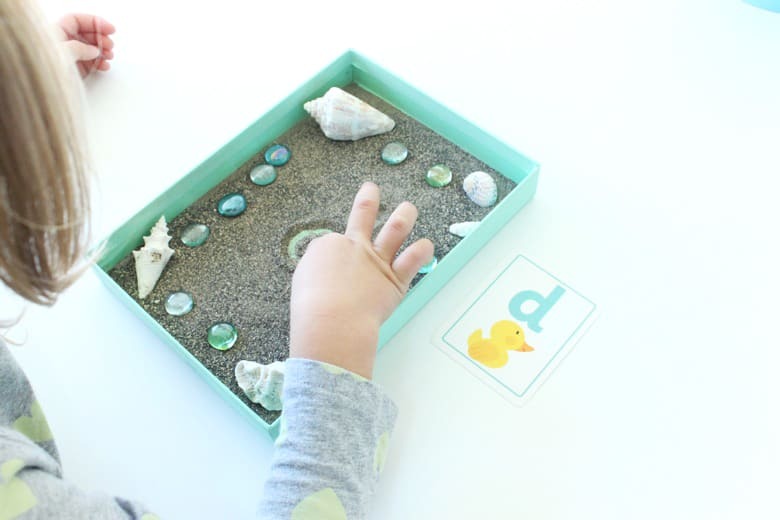 By giving the child a tray of Kinetic Sand, along with a few tools, materials for molding or building, and the cue Hmmm, what can we make?, you are providing that child the opportunity to work on ideation, which contributes to the foundation of creative thinking. While pretend play does tend to involve creative thinking, it requires a different set of developmentally-based cognitive skills and is definitely its own category. Research shows that toddlers and preschool-aged children require concrete props in order to facilitate symbolic play, so pull out those miniature bowls, spoons, and characters (like these mini animals) to stir up a little creativity! The preschool years are the prime years of creativity, so follow the child’s lead as they use Kinetic Sand to feed the animals, give them a bath, or scoop you a bowl of chocolate ice cream. Did you know sensory play with materials such as Kinetic Sand can actually help children expand their speech and language skills? It’s not just the Kinetic Sand, it’s the interaction that occurs between the child and their communication partner (that’s YOU!) that helps expand those speech and language skills. Speech-Language Pathologist Katie Yeh shares a host of tips on her blog about how to help your child talk! A few simple yet powerful tips include slowing down and being present, getting down at your child’s level and making eye contact, following your child’s lead, becoming a narrator, and commenting and asking questions. Click HERE for all of her easy-to-implement tips to help your child talk as you engage with him or her through play (including sensory play!). As I mentioned earlier, deep pressure can be organizing to the body. So all that squeezing can actually do more than simply strengthen little hands. It can get brains ready to learn, too! I often use squeezable materials with my clients in therapy before they must sit and focus on a task such as writing, cutting, or playing a game at the table for this very reason. Back-to-school is just around the corner and we’re very slowly transitioning back into more of a routine after a long, wonderful summer. For us, getting back into routine means making time for playful learning activities—writing trays like this one are a big hit. 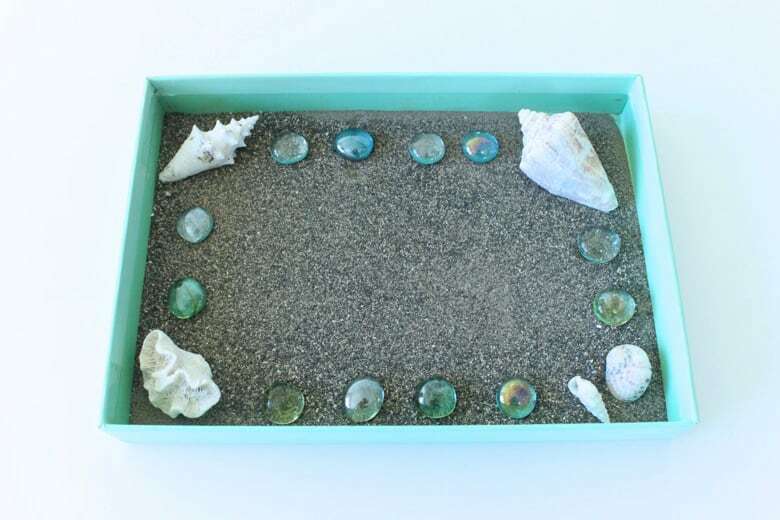 Since we're still hanging on to the last bit of summer, we decided to create a beach-themed tray using sand, shells and glass gems. In the past, we've made them with all kinds of materials and themes, so feel free to get creative and use what you have around the house. 1. To create your writing tray, pour enough sand into your tray, lid, or plate so that the bottom is just fully covered. Next, add some visual interest by adding your shells and decorative items along the edges in order to create a picture frame of sorts. 2. Now it’s time to play! Invite your little one to take out his or her "finger pencil" and create marks, numbers, letters or simple words in the sand. As kids draw in the sand, the colour of the tray, lid, or plate should be revealed below. If not, it probably means that you have a bit too much sand—simply remove some and try again. 3. Now for the best part. When you’re ready to erase the marks you’ve made, gently shake the tray, lid, or plate side-to-side and you’ll find yourself with a fresh canvas in a few seconds flat! 4. Once your child has had some open-ended time to experiment with the tray, try adding in your letter, number or word cards to extend the activity. 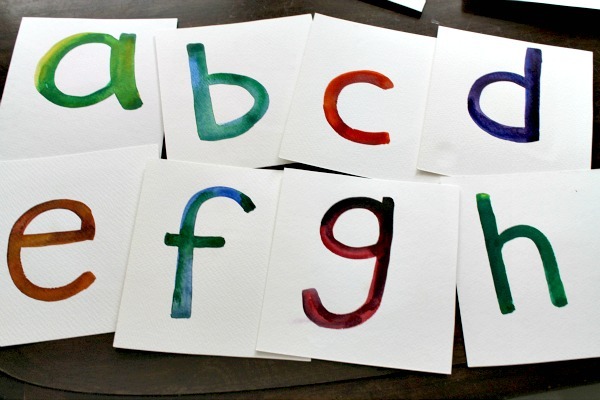 Ask your little one to copy what he or she sees on the card, remembering to start at the top of each number and letter. This is a great hands-on way to work on letter and number formation. As long as your tray is big enough, it’s a fun way for older kids to practice spelling words too. Remember, it's fun to get creative with your writing trays! Create new ones based on the season or your little one’s interests. 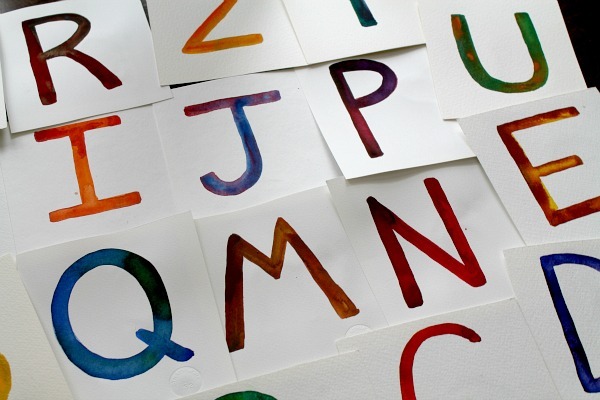 If you’re a teacher, here’s an idea—pour inexpensive table salt into a class set of colourful plastic plates, stack them up and tuck them away in your cupboard for printing practice and other writing activities. Prep-free and so much more fun than pencil and paper worksheets!